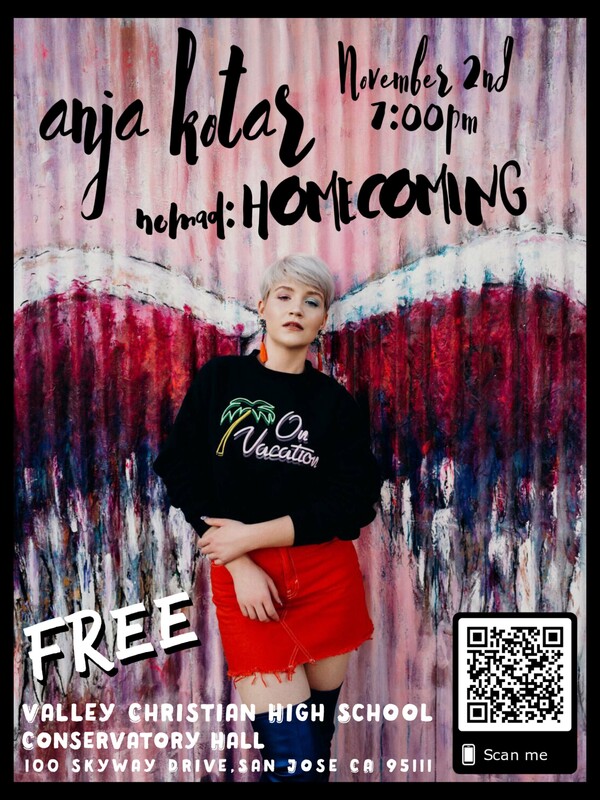 The VCHS Music Technology class is preparing a special free acoustic show by Indie Pop artist Anja Kotar. She has over 250k streams on Spotify and a single from her album NOMAD was nominated for Best Pop Song at the American Songwriting Awards last year. She is a Valley alum (graduated in 2015) and will be joined by a fantastic guitarist and fellow Valley alum Dimitri Morris. Scan our poster to listen to her music on Spotify and come join us at her show on November 2nd where she will be playing acoustic versions of her original songs as well as some of her favorite covers. Along with the show, Anja will also be hosting a private Listening Party before the concert where she will be exclusively playing her brand new single that won’t be released until next year! You can enter the Listening Party by finding Anja on Instagram (@anja.kotar) and send her a private message saying why you’d want to hear her new song. She will pick up to 15 people to join her to listen to her single, hang out, answer questions, and give away some sweet gifts. There is also a meet and greet with the artist starting at 5pm in the Conservatory Hall. Come learn how it is to be a professional singer/musician in today's industry!